Instantly reveal smooth, radiant camera-ready skin. DERMAFLASH instantly creates a flawless canvas for skincare and make up. 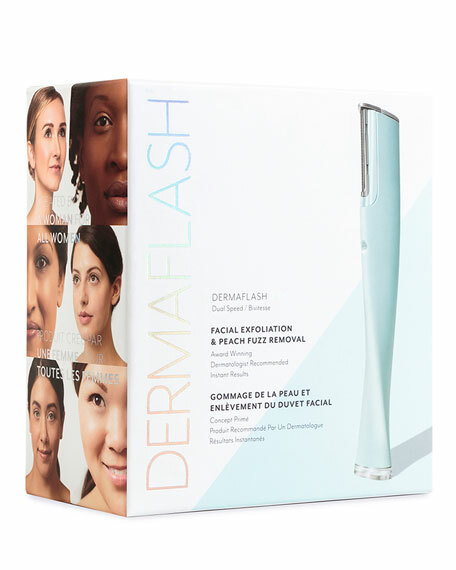 DERMAFLASH 2.0 now comes with 2 speeds to customize the exfoliation treatment. 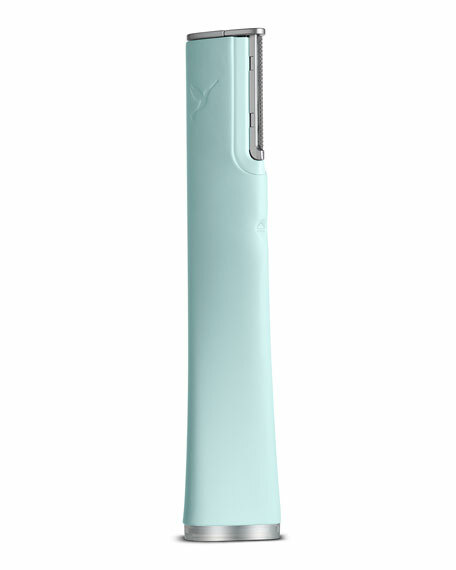 Speed 1 for a gentle exfoliation and first-time users. Speed 2 for a more invigorating and sensorial experience. DERMAFLASH instantly removes dead skin cells, built-up debris, and pesky peach fuzz. This device was designed for the delicate skin on a woman's face and was created by a woman for ALL women. DERMAFLASH enhances the power of skincare products by erasing the barrier to penetration, while creating a flawless canvas for makeup. DERMAFLASH instantly reveals smooth, radiant, younger-looking skin. Step 1: Place a small amount of PREFLASH onto wet hands and create lather. Massage onto face, rinse well, and pat dry. Step 2: Press power button once to activate gentle vibration. A second press delivers a more invigorating experience. A third press turns device off. Beginning in front of your ear at cheekbone, hold skin taut with finger from opposite hand. Using short feathery strokes glide DERMAFLASH across entire face, avoiding surface of lips, nose, and eyelids. Step 3: Massage a small amount of POSTFLASH into skin to hydrate and balance after treatment. To dispose of single-use Edge, point top of device towards wastebasket and press eject button. For best results ALWAYS begin with PREFLASH and massage POSTFLASH onto face to hydrate and balance after treatment. Recommended use is once per week. Superior exfoliation and painless peach fuzz removal. Removes barrier to penetration, allowing skincare to work more effectively. Appropriate for ALL ages, ethnicities, skin tones and types. Gentle and safe for even those with sensitive skin. Designed for use on specific areas of the face and chin. It is not intended for use on other areas of the body. Avoid using on surfaces where cuts, abrasions, or any kind of healing is present. Do not use on active acne, psoriasis, rosacea, skin with rash, sunburned, or distressed skin. Always avoid using on moles, cancerous areas, or lesions. Do not use on skin which has recently been treated with a laser or recently chemically treated. Use a new Edge for each DERMAFLASH treatment. For Dara Levy, the creation of DERMAFLASH is the culmination of her love of beauty and wellness. Known as the go-to "beauty maven" in her circle of friends, she was also generous and eager to share her discoveries. Dara took her passion for all things aesthetic to a new level when she opened a luxury medspa in Chicago's Gold Coast in 2009. For the next five years, Dara put both her creativity and diehard passion for the best lotions and potions to work while treating some of Chicago's most famous faces with her signature treatments. One of her breakthrough treatments was called DERMAFLASH, a unique twist on the concept of dermaplaning to exfoliate the skin. 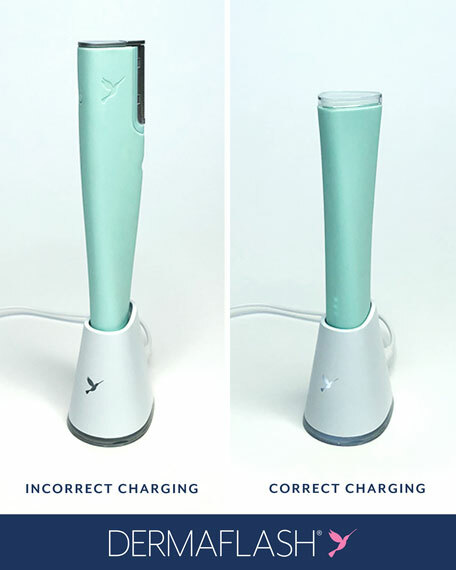 The in-spa response to DERMAFLASH was so amazing that Dara had the idea to try to replicate the premise and results in a handheld device that would be simple for anyone to use. After many rounds of brainstorming sessions, a handful of prototypes, and recruiting lots of her friends and her two daughters' friends as testers, DERMAFLASH was born. DERMAFLASH is Dara's first beauty creation, but she has more innovations in the pipeline. "I want to break new ground by giving women solutions they can use at home or on-the-go to address all of their beauty challenges," she says. For in-store inquiries, use sku #2598206.